Recycle boy at the Kick-Off of the 2012 Recycle program. This table was completed in 2011 by an Eagle Scout as a community project. 2011 was a busy year for Abbotts Hill Elementary Green School programs! - The AHE Jaguar Environmentalists established a bi-weekly, paper recycling program. It has been a huge success for the students who love to do their part in preserving our environment. And, teachers love it so much, they requested the students consider collection on a weekly basis! The students are continuing their efforts to do their part in preserving our environment. - Also, Green School programs were awarded a monetary gift from Malcolm Barnard, a high school student who succeeded in his effort to have Johns Creek, GA become a National Wildlife Federation (NWF)-certified wildlife community. Each school who participated in getting individual homes and businesses certified was awarded this money for their efforts in helping him achieve his goal. AHE was a proud supporter of Malcolm’s conservation leadership. - Jaguar Environmentalist completed a project that involved collecting bottle caps which they turned into a beautiful rainbow sculpture that is proudly displayed on the fencing in the Outdoor Classroom. - A goal for 2012 is to launch a “No-Idling” campaign to protect the health of students and the environment. - Another goal for Green School is to establish a “Waste-Free Lunch” program which will focus on cutting down on packaging and food waste. Efforts include educating students to pack lunches in reusable containers and obtaining more recycle bins for plastics and compost materials. The bottle cap sculpture. It really came out beautiful! The jaguar paw print bed filled with growing, thriving plants that have attracted lots of butterflies. Completion of paw print on Nov. 2011. Kathy Johnson, BFES EE Chairman. Birmingham Falls has had an active Green Team of 4th grade students that take care of the school's recycling weekly. The team collects the classroom paper and dumps it in the rolling carts filling up about 15 carts per week. Being a new school, they are in the process of fundraising for an outdoor classroom and spent a year planning it with a task force. They have installed 2 raised garden beds for teaching about plants and learning about healthy vegetables. 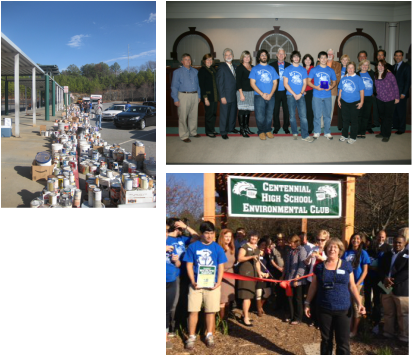 Centennial HS has a very active and award winning Environmental Club, led by club sponsor, Julie Burroughs. The Club has had two paint recycling events which has raised thousands of dollars to be used for recycling bins (clearsteam type) and outdoor classrooms and gardens. The club is responsible for all the recycling at the home football games, and has an annual locker clean out for paper at the end of the year resulting in several tons of paper saved from the landfill. They participate in the Bring One for the Chipper and the Annual Rivers Alive Clean up as well as the Clean Air campaign, and canoe cleanups on the Chattahoochee. The club meets weekly after school and often has guest speakers, even Charlie Seabrook the renown AJC nature writer visited the club! Principal Freiberger receives sign from Milton officials. A parent volunteer and employee of Milton’s restaurant is assisting our school in the preparation, planting, and upkeep of the organic gardens. We are planning to possibly harvest pumpkins and corn in the following school year. The Crabapple Crossing National Elementary Honor Society began a “Save the Pond Campaign.” The funds are going to be used to repair the water habitat. Currently, we have raised about $2300, and we are continuing to pursue funding. Once funding has been established, we will repair the pond habitat and move forward with other habitat revitalization projects in the 2012-2013 school year. We emptied 39, 96 gallon bins over the course of four weeks. Each bin was estimated to weigh 166.08 pounds of mixed recyclable material. Using the calculation of 1.73 pounds of recyclable material per gallon, CCES recycled 6,477.12 pounds of material! We are very excited to report that CCES placed fourth out of forty-five other Georgia schools. We are very proud of our placement, and we hope to compete again in the future. Following is the link to the announcement. This year, we are also proud to announce that we are a Georgia Green Ribbon School. We were chosen to be one of four schools in Georgia with this honorary declaration made at the state capitol. Crabapple Crossing ES outdoor classroom! The CMS Learn and Serve Garden grew from a seed of an idea from Science Teachers Glenn Mize and Jeanetta Lewis and Language Arts Teacher Shelley Merritt who wanted to bring their lessons to life in the garden by giving students “get-your-hands-dirty” earth science experiences while giving back to our community. Mr. Mize wanted students to experience beyond the books and couple what he learned in the garden from his father and grandfather. He wanted kids to see “the miracle” of how one seed from a dead plant can be planted and produce a vine that spreads out across the garden and bears fruit that feeds hundreds. Dolvin Elementary has a well established EE program with the support of their PTA. They present EE to the different grades once a month through activities, games and experiments that support the Science Curriculum. For more information visit their PTA Website at. Eco Explorers on Adopt a Road Clean up. 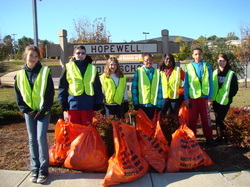 The school's environmental efforts are largely carried out by the Hopewell Middle School Eco Explorers who actively addresses environmental improvements both within our school and in our community. The eco-explorers campaigned with green signs encouraging the community to reduce, reuse and recycle. Recycling: The school has recycled paper and plastic and ink cartridges over the last 6 years. We work closely with Waste Pro and the City of Milton Grows Green program to maintain the recycling and encourage the community inside and outside the school to recycle. Litter Clean Ups: Eco-Explorers continue to maintain the roads adopted in front of Hopewell Middle School and on Cogburn Road. We met twice this year to pickup trash. Adopt-a-road is a deterrent to littering. There is very little trash on these roads. 3. For the second year in a row, Hopewell participated in National America Recycles Day, November 15. The effort produced more than 500 students pledging to recycle. The students signed a pledge to reduce, reuse and recycle. The banner with student signatures is hanging in the atrium. Eco-Explorers is also committed to encouraging less plastic water bottles and more reusable water bottles. 4. Students renewed their pledges in March 15, 2012, during Hopewell Goes Green week. Eco-Explorers sold green lollipops to raise funds to purchase additional recycling containers and for additional environmental education for the club members. PTA volunteers and the Media Center created a beautiful and very informative Hopewell Goes Green bulletin board to support Hopewell’s green efforts and to educate students about protecting the environment. Eco-explorers with the support of Junior Beta students, mounted a campaign to encourage bus ridership to and from HMS and to discourage vehicle engine idling in the parking lots. In 2012, we will place permanent signs in the carpool area to promote no idling. This effort continues. The school is working with the PTA to help plant more and mulch more around the school grounds. Signs of the efforts are throughout the school grounds. This goal is ongoing. The Milton Environmental Club created a Pollution Awareness Week during lunch time for a week in March 2012, funded by a grant from the City of Milton. The topics were plastic pollution in our oceans, non-point source pollution, and indoor air pollution. They had 17 Environmental Club students who were responsible for promoting Environmental Awareness and the students handed out over 600 wristbands to students who visited the table and signed the pledge banner. Club members also participated in Milton's Rivers Alive program in Oct. 2011. Display used at pollution week at Milton HS. Dr. Bartlett (right) explains the NWMS permaculture project. Under the direction of 7th grade science teacher, Dr. John Bartlett, the Environmental Club developed a permaculture (permanent agriculture) project on the school grounds. The after school club also participated in the Milton Earth Day Festival with a booth on making wise choices.